Simply submit this official entry registration form by the deadline posted in the Official Rules and YOU could WIN $5,000.00 A week for LIFE! NOTE: Make sure to use a spare email account for this. I have been dealing with them since I have gotten my PC and have yet to win.Once you have been confirmed the take you to there sister site and they have mag. and some as seen on TV stuff. Once they had these scratch off tickets mixed in with there product and I won 2.000 dollars now they sent me this eye cream but they did not mention my money so no I am not a fan. And this was less then a week ago. Welcome to my house My Prize Patrol PCH 2/28/2013 I am already to win $5,000,00 a week forever. Remember California I will waiting!!! Oh how I wish I could win pch 5,000 a week for life on feb28th I want to win so so bad you just don’t know how much.#1830 forever SuperPrize winner. i hope i win im in fort worth tx, we could really use some money. i have moved a lot and changed my email but i have entered pch sweepstakes for about 9 years now. i know i will win something someday. the 5000 dollars a week forever prize is mine! I would think Publisher’s would contact you before 2/28/13 if you are a winner to make sure at your home on the day they come knocking. Sounds too quircky to me. boy: I like to this money for life I need a house. 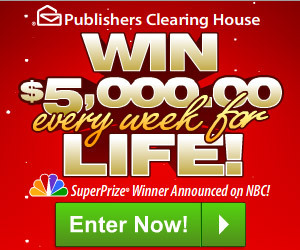 I want to win $1,000,000 Plus $5,000 A Week For Life! never won but I feel this is the year for me. PCH is giving a prize away for a Explorer FORD suv & just the color I wanted for the last 3 years.My car is going on 18 years old. Bless all of you ………Caroline C.
I angelaravin58@gmail.com would like to to say that this the best game ever..